The layered terrains of the polar regions of Mars are among the most exotic planetary landscapes in our Solar System. The layers exposed in the south polar residual cap, vividly shown in the top view, are thought to contain detailed records of Mars' climate history over the last 100 million years or so. The materials that comprise the south polar layers may include frozen carbon dioxide, water ice, and fine dust. 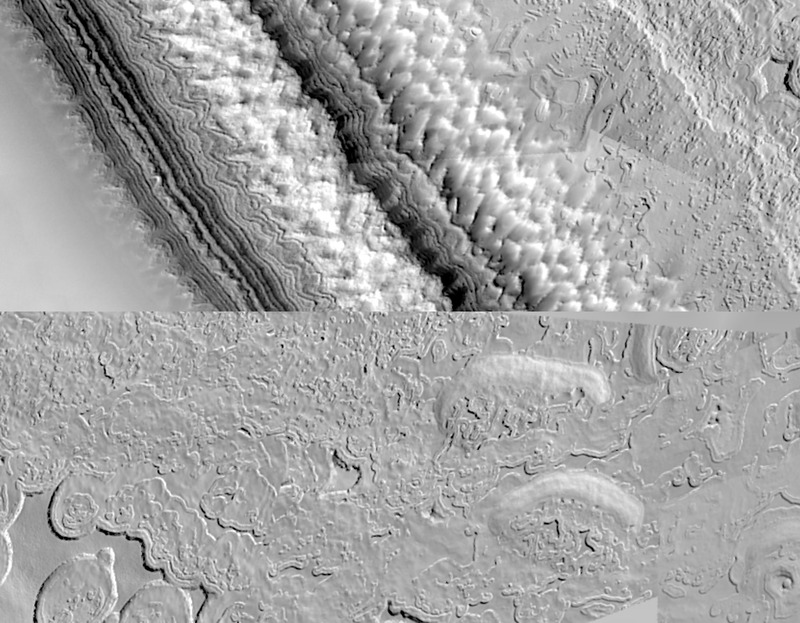 The bottom picture shows complex erosional patterns that have developed on the south polar cap, perhaps by a combination of sublimation, wind erosion, and ground-collapse. Because the south polar terrains are so strange and new to human eyes, no one (yet) has entirely adequate explanations as to what is being seen. These images were acquired by the Mars Orbiter Camera aboard the Mars Global Surveyor spacecraft during the southern spring season in October 1999. Each of these two pictures is a mosaic of many individual MOC images acquired at about 12 m/pixel scale that completely cover the highest latitude (87°S) visible to MOC on each orbital pass over the polar region. Both mosaics cover areas of about 10 x 4 kilometers (6.2 x 2.5 miles) near 87°S, 10°W in the central region of the permanent--or residual--south polar cap. They show features at the scale of a small house. Sunlight illuminates each scene from the left. "Gaps" at the upper and lower right of the second mosaic, above, are areas that were not covered by MOC in October 1999.